Ready to break up with diet culture? ​Lose Hate Not Weight Babecamp is a 4-week online course designed by acclaimed body image expert, Virgie Tovar, to hold your hand through finally breaking up with diet culture and taking your rightful place in the babe pantheon. Q: Why Did You Design Babecamp? I put my life on a hold for a VERY. LONG. TIME. I was always on a diet. I engaged in starving behavior, obsessive exercising, and no matter what I did I never felt good enough, pretty enough or thin enough. I created Babecamp because I have walked a mile in a different pair of (much shinier) shoes. I not only believe it is every person’s right to have a harmonious relationship with their body, I go a step beyond that. I believe in every person’s right to feel like a total babe. That "I am never good enough" mindset is a learned ideology that is A LIE. 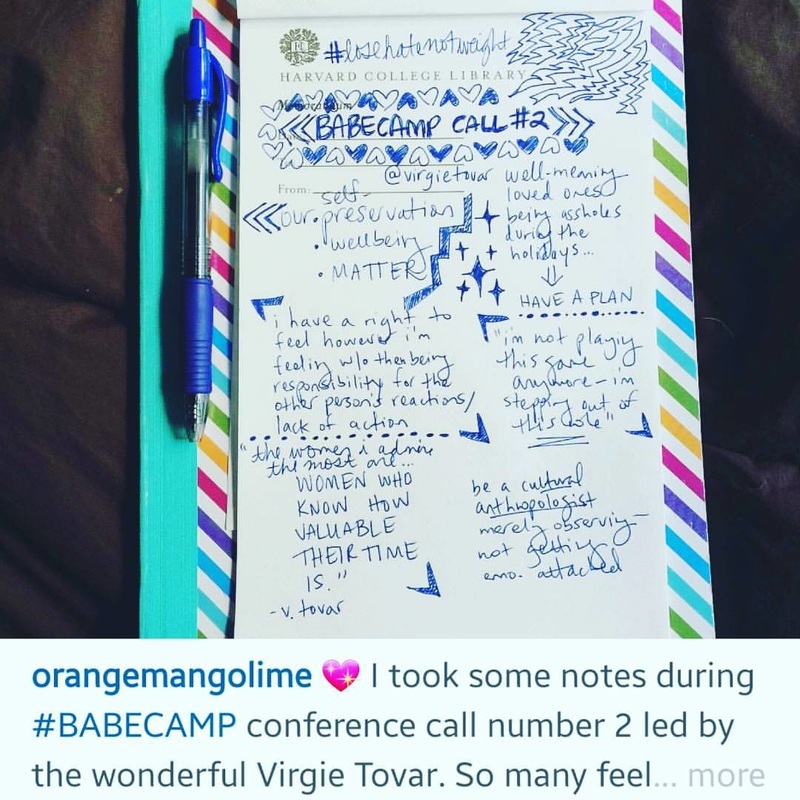 Babecamp is about replacing that mentality and re-centering self-care and self-love, which are touchstones of our native relationship to our body. Q: Is the Facebook group completely private? Yes. At the beginning of Babecamp I will ask that you send me a friend request via Facebook and I will add you to the group which is invisible to anyone but participants. Q. When's the Next Babecamp? Q: How much does Babecamp cost? Get in touch for the pay-what-you-can option! Q: What if I want to work with you one-on-one? "Being able to interact with Virgie directly and ask the exact thing I wanted to know and gain your insight and expertise on that issue was so helpful and really allowed me to move forward with some areas I was stuck." "This workshop was perfect for my needs, it's changed my view of myself and my world. Body love is now a moment-to-moment practice in my life! Thank you and love you!" "Even though I live in Germany, I was able to attend the telephone conference and even get to ask questions!!" "Mainstream diet culture is so pervasive, it's easy to forget that we have an alternative. I appreciated the reality check on that front!" "Honestly it's the first time I purchased a course and did it with 100% gusto. I looked forward to reading the emails everyday... And the price point felt doable... So I did it! The calls were extremely helpful and I loved getting to ask and share things. I'm a babe!! Thanks for creating the space for me to own that." "...I wish I could have a pocket Virgie that I carried around with me to remind me of all the wonderful things I learned as I move through everyday!!"